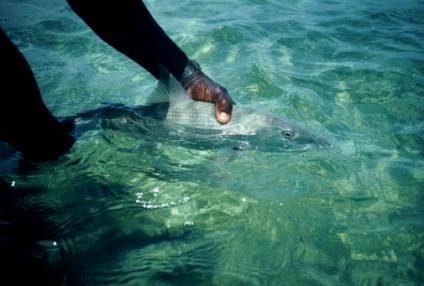 “Why bones are special—The bonefish is the nearest thing there is to a perfect gamefish for fly-fishing anglers. A voracious predator, it readily (but warily) takes flies. It accelerates faster and sprints farther than any other fish you take on light tackle. It fights more doggedly than most fish twice its size. Body: 8 pieces of Tan Aunt Lydia’s Rug Yarn (Antron) figure-eighted in (Merkin fashion) on top of hook shank, and trimmed to appx dime shape. * I didn’t have a dark brown pen, just dark umber. The barring should be darker – more contrasting. ** While conventional wisdom would dictate 3 legs (per side), Ralph contends permit can’t count, so this is tied true to his original pattern (which worked, so apparently they can’t count). *** I didn’t have any Krazy Glue handy – just used some head cement. Ralph put drops of Krazy Glue on the legs near the edges of the yarn body (and worked into the yarn slightly) to keep these sticking out at the appropriate angles. in quest of permit. The first day out, just a couple were taken, one by first time permit fisher Dr. Ralph Cifaldi. Ralph was using a crab pattern of his own concoction; a variation on the Dorsey Kwan, distinguished by a long tail of amber dyed polar bear barred with a brown marking pen. The second day, there was better success in the group, with Ralph coming in as top rod with a “hat trick” – 3 more permit on this just his second day chasing permit! This piqued our interest a bit more in Ralphy’s unorthodox pattern. 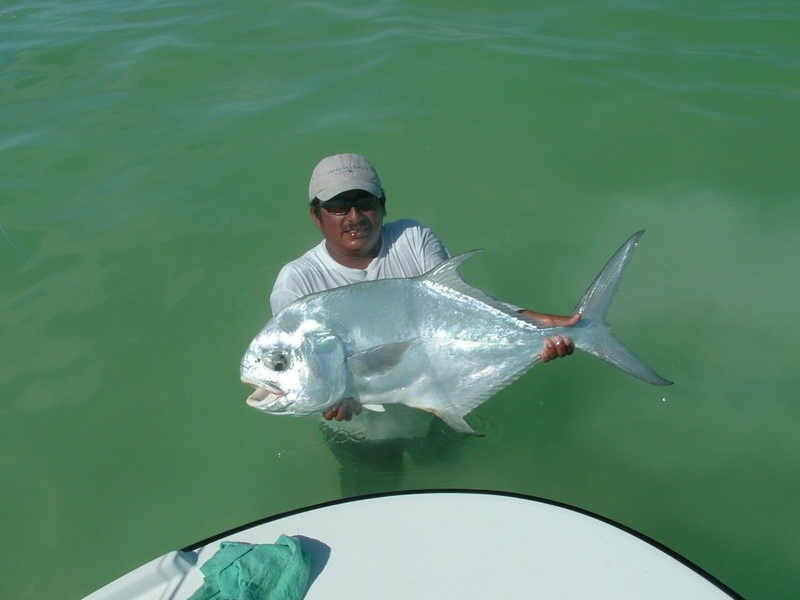 The third day, more permit were released by the group, but again the top rod was Doc Ralph, with another hat trick! 3 days into the trip and Ralphy had 7 permit under his belt. The excitement over Ralphy’s fly grew, and being the generous soul that he is, he stayed up late cranking out more of his crab patterns so as to present each one of us with one at breakfast. There was no doubt in my mind what fly to tie on that morning! We ran back into the bay, inside of the tip of Vigia Grande. The wind had slightly clouded the water along the south side of the bay, and my superb guide Manuel (Tarantula) worked the edge between the cloudy and the clear water. Suddenly I spotted a huge permit working up tide toward us. I called to Manuel and he kicked the boat right, and with a couple of strong pushes on the pole put me in position to intercept the fish. I launched Ralph’s fly, it landed perfectly, I made a one-foot long strip and the big fish quivered, lunged forward and ate it. It immediately took off on a searing and what I expected to be a “reel-emptying” run. But about 70 yards out, it just stopped, and slowly pulled. I looked at the bottom and it was moving. Yes, now he was just leisurely towing the boat across the bay! This went on for 42 minutes until finally we got the fish close enough to tail it. But Manuel couldn’t get it over the gunnel! Finally, he went over the side in chest deep water to “wrassle” the beast into submission. We didn’t have a boga grip, but Manuel said his largest “bogaed” fish was 38 pounds, and allowed as how this guy was just about as big! We settled on 35 as an estimate. By the end of the week, our party of 8 had tallied an amazing 35 permit on fly, and quite a few over 20 pounds. 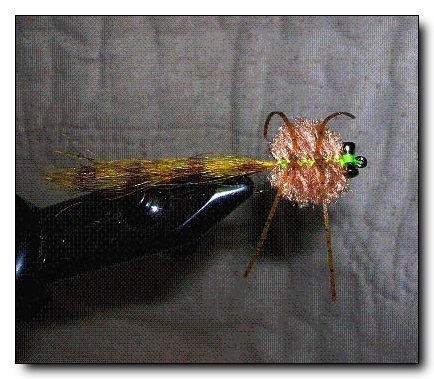 And Ralph’s pattern accounted for 17 of these, and the fly didn’t even a name. The last evening, our group sat around the palapa having beers and trying to come up with an appropriate name for Dr. Ralph’s (a gynecologist by the way) remarkable fly. Finally John Canavari burst out, “I’ve got it! The Gyno Crab”. And the name stuck. Google it! I can’t swear there’s something special about the pattern – maybe it was just a case of a lot of happy permit eating well. But if any fly catches any permit, I want to have it in my arsenal! Hope this works as well for you.